While we're all waiting for actual hoverboards to be invented (garish 80s colour schemes included), some of its bizarre yet instantly iconic gadgets are actually becoming a reality. 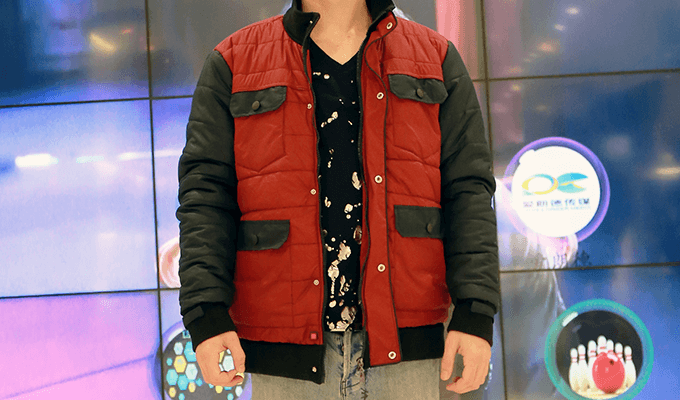 Remember that self-drying jacket from Back To The Future 2? Yup, someone's only gone and made one. And now you can own one, too! Great Scott! The SDJ-01 from start-up company Falyon dies you from the inside out in no time by circulating high pressure throughout the jacket. Said air is directed by air amplifies fitted inside the garment, which are powered by a small rechargeable battery. Actually by 'no time' we mean a few minutes for light rainfall - if you happen to get properly soaked, we're assuming it'll take considerably longer. It's currently doing the rounds on Kickstarter and the project has already surpassed its $12,000 goal with a week left before it wraps up. Falyon is promising the jacket will ship by April 2016 and you can either invest in a Marty McFly-style red and black number or select a more muted colour including cobalt blue and metallic silver. A standard edition will set you back $149, while a BTTF-esque one will cost you an extra $50.